The makers of CharcoCaps, an all natural, easy-to-swallow over-the-counter activated charcoal capsule for the treatment of intestinal gas, is offering a monthly $100 pre-paid gasoline card (while supplies last). Simply take the gas etiquette quiz and sign-up to win the gas cards by visiting Charcocaps.com. 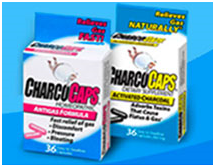 Everyone experiences gas about 14 times a day but CharcoCaps help to naturally relieve gas discomfort, pressure and bloating which helps absorb gas and the embarrassing odor. Health tips, videos and a downloadable food diary are available at CharcoCaps.com. *Disclosure I received a free box of CharcoCaps in exchange for sharing this information. Whole Milk Is Not Appropriate For Kids: So Why Are Schools Still Serving It?